Over the last 40 years, the astounding influence of synthesized sounds in contemporary music is incontestable. And last year, IK Multimedia paid tribute to one such iconic synth, the Roland Juno-60, with an authentic software emulation it calls the Syntronik J-60. The Juno-60, came from the mind of Japanese inventor Ikutaro Kakehashi. No stranger to musical instrument design, Kakehashi, along with the team at Roland, his second instrument company, rose to become perhaps the most important electronic music instrument manufacturer of the last four decades. The Juno series of polyphonic synthesizers were launched during the same period as other iconic instruments from which whole genres emerged. Between 1980 and 1984, Roland released not only the Juno-60, but the TR-808, Jupiter-6, Jupiter-8, TB-303, TR-606, SH-101, TR-909, and TR-707. Released in September 1982, harnessing six voices of polyphony, 56 presets, and an IR3109 filter chip, these features, along with the unit's tuning stability, made the Juno-60 a popular instrument choice for a wide range of artists. Roland's first synthesizer with digitally controlled oscillators and memory found its way to many famous pop records of the era, such as "Borderline" by Madonna, "West End Girls" by Pet Shop Boys, "Caribbean Blue" by Enya, "Take On Me" by a-ha, and "Save A Prayer" by Duran Duran, among many others. The Juno-60 was a favorite synth of the influential early house music producers out of Chicago, as heard on Mr. Fingers' seminal Deep House blueprint, "Can You Feel It". Modern day synthesizers have incrementally gotten smaller, more affordable, and mainly focused around digital synthesis technologies. The ability to accurately model the sought-after synth sounds of any era via software is the current state-of-the-art. These advancements in digital signal processing have given rise to a myriad of emulations of classic synthesizers, including the nostalgic Juno sound. 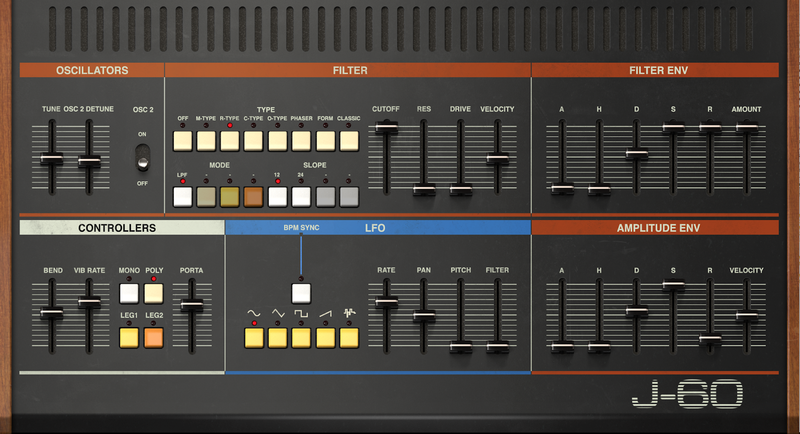 IK Multimedia recreated the Juno-60 sound from its comprehensive virtual instrument collection, Syntronik. Featuring a step sequencer and a modular effects rack not found on the original synth—and including a large assortment of dynamic, modulation, and spatial effects processors—the Syntronik J-60 ships with 78 versatile stock presets of basses, pads, leads, strings, plucks, and FX that the Roland Juno-60 has become known for. Developed with IK Multimedia's proprietary DRIFT technology—and designed to accurately reproduce the idiosyncratic behavior of hardware oscillators—the Syntronik J-60 works both as a plugin inside your prefered digital audio workstation, and as a standalone virtual instrument. To illustrate just a fraction of the stunning sonic character the Syntronik J-60 is capable of, I recreated one of my all-time favorite pieces of synth music, with sounds from the Syntronik J-60 Synthesizer. Below, listen to my version of "Canyon Voices" by the incomparable synth pioneers Tangerine Dream.